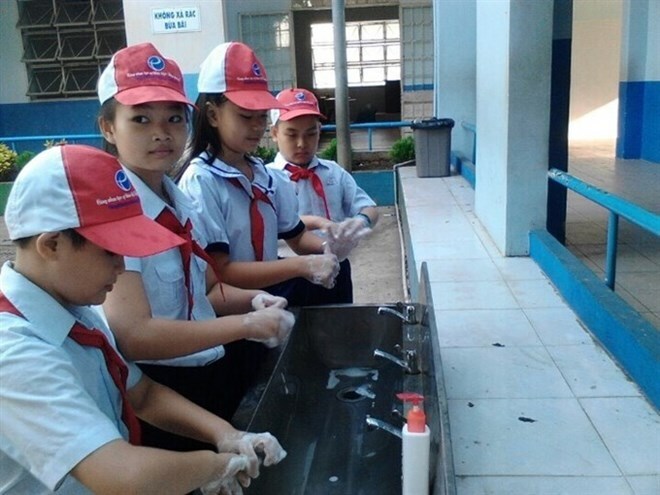 HCM City (VNA) - The Department of Preventive Medicine has instructed health officials in provinces and cities nationwide to cooperate with education departments to strengthen cleanliness at schools to prevent outbreaks of hand, foot and mouth disease and dengue fever. At a recent press meeting held in Ho Chi Minh City, Dr Tran Dac Phu, director of the general department, said that students in many provinces and cities nationwide will start the 2017-2018 academic year on September 5. Phu required preventive health officials nationwide to guide school managers and teachers to manage waste and water containers away from a school’s campus to prevent from mosquitoes, which transmit dengue fever to humans. Kindergarten toys and other devices should be washed to avoid transmission of hand, foot and mouth disease among children, he added. “If one kid gets the disease, it is easy to transmit to others at school,” Phu said. Nguyen Tri Dung, Head of the HCM City Preventive Health Centre, said that following the General Department of Preventive Medicine’s requirements, the centre has sent a communiqué to people’s committees, health centres and private as well as public schools in districts to implement the preventive measures. The centre has provided chloramines B and Javel to schools to disinfect classrooms, toilets and kitchens, Dung said. Teachers should guide their students to wash hands frequently, he said, adding education on preventive measures against dengue fever and hand, foot and mouth disease should be strengthened for students and their parents in meetings, loudspeakers and posters at schools. According to Dung, school teachers should bring students who are suspected of being infected with these diseases to hospitals and report them to local health officials to carry out surveillance and preventive measures against their further spread. Preventive measures against the diseases should continue during the school year, he added. By August 10, the city has recorded 12,200 cases of dengue fever, an increase of 27 percent compared to the same period of last year, he said. However, the incidences have not increased over the last seven weeks, he added. In the whole country, 80,555 infection cases have been recorded since the beginning of the year, an increase of 33.5 percent. Twenty-four people died due to the disease, according to the report of General Department of Preventive Medicine.